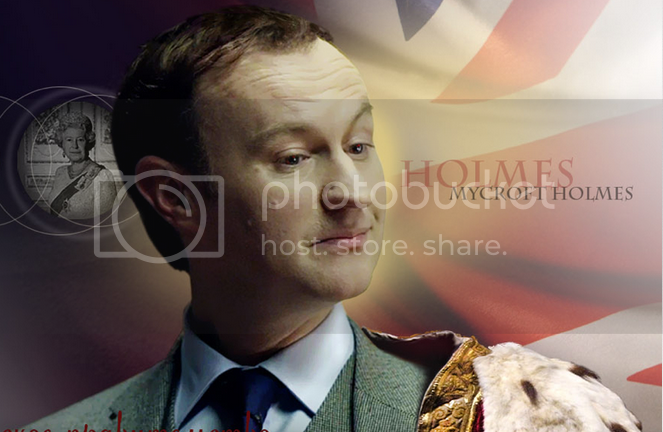 BBC Sherlock Fan Forum - Serving Sherlockians since February 2012 » Mistakes - anyone notice any? » Mistakes - anyone notice any? Mistakes - anyone notice any? When the cabbie texts Sherlock to say "Come with me", how did he get Sherlock's mobile number? We know he has John's number because they texted him earlier off John's phone, but how did he get Sherlock's? The only explanation I can think of was that he got it off Moriarty...who is bound to be able to get hold of people's numbers easily - he's got the genius and the technology to do it. Re: Mistakes - anyone notice any? I suppose he might have got it from someone in the police as they have his phone number. 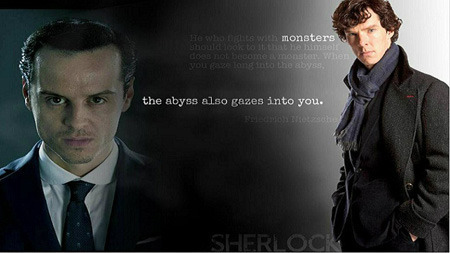 Remember there is an assassin watching Lestrade in The Reichenbach Fall. Maybe, I think it's likely, that Moriarty has people inside the police. 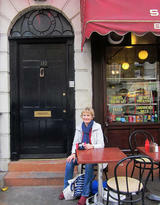 Remember in The Great Game he knows Sherlock has gone to the police- the old lady tells him. If you watch the last bit of The Great Game you will see Sherlock's hand with the gun make a mysterious change. 1.How does Lestrade manage to stand in Sherlock's and John's flat all of a sudden despite the fact that there's no-one to open the front door for him? Mrs Hudson at this time is present in the flat, too. 2. When Sherlock and John depart for Brixton/Lauriston Gardens it's bright outside. On their arrival in Brixton it's deep dark night. What took Sherlock and John so long? A gigantic traffic jam? A "short" detour via Afghanistan? 3. Watch the shot cabbie lying on the floor in a puddle of black blood. 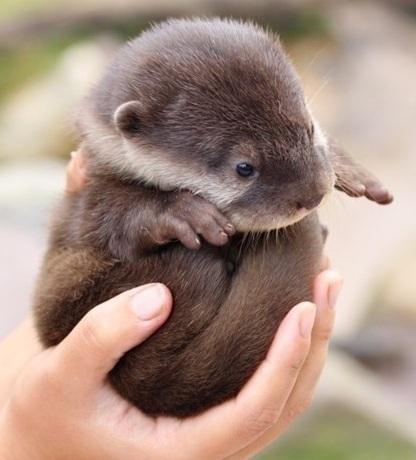 When Sherlock screams: "The name..now...!" the blood has miraculously vanished. John: "Have you spoken to Mycroft, Molly, uh, anyone?" Mrs Hudson: "They don’t matter. You do." I BELIEVE IN SERIES 5!
" Don't want to use mine, always a chance it will be recognised. The number's on the website". 1. I'm not sure when you mean????? Near the beginning? I imagine he let himself in. He is the police after all. And it didn't look like anyone locked the door when they went inside at first. 2. It's early evening when they leave. Yes, it's daylight but you can see the street lights are on and cars & buses have headlights. As they drive, you can see the sky behind Sherlock at one stage is growing darker, with just a tinge of daylight still visible. At that hour of the day, I daresay there would be a fair amount of traffic & looking at a map, I would imagine it would take some time in traffic to get there. 3. 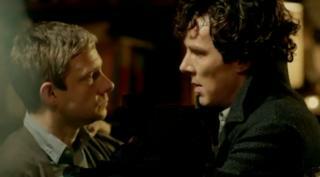 Didn't miraculously vanish, Sherlock was using him as a sponge & it all soaked up into his coat. Honest! His head could have rolled to the left in pain; Sherlock could have moved his foot upwards & it was obscured even more but yes, it does look slightly odd. Looking on the map, Brixton is about 6 miles away - that implies a more or less 30 min taxi ride. And it's not only at their getting off the cab in Brixton that it is dark - but already during the deduction scene in the cab, shortly after leaving Baker Street, I presume... Living in nearly the same latitude I can tell that darkness never would pop up out of the blue - there's always a dusk. Jeez, I'll have to watch again more carefully - I'm obviously seeing but not observing, lol. Well it looked like dusk to me, lol. Watched this Ep again today...I noticed that when they're in the restaurant, Sherlock tells John to get something to eat because it might be a long wait. So one minute he's looking at the menu, and then the next minute he's eating, without actually having ordered anything, or without it cutting to another scene to allow for a time gap. But after Angelo has left the candle on the table he goes towards the camera and disappears - presumably - into the kitchen. The next setting is from outside through the window when John starts with "People don't have arch enemies..."
It's a bit quick but there is in fact an unobtrusively time gap. Probably the director/writers calculate that the audience will assume some time has passed because from settling down at the table to John getting his meal served would suggest time passing without John actually having to order the food on screen. Ok, one thing I reacted to when rewatching the episode. Now its been a bout a month+ since I watched it the last time though so my memory can be blurred/incorrect. In the intro we see the victims in distress taking the pills, but the pills are in a small vial with 2 pills in it. This would mean either that the cabbie is lying to Sherlock in the end, that he was cheating with an antidote, and poisoning the victims even if they chose the correct one, and he's simply not so smart as he portrais himself. As there is no visual cues on the pills, and no way of telling them apart he simply wouldnt know which one was the poison and which one was the sugarpill. He also coulnt have played the game as he did with Sherlock as he wouldnt be able to put them on the table, and influence their choices with body language, subtexts and so on that he tries to with Sherlock. its a mistake from Mr. Moffat and co. It is of course possible he had containers with 2 pills of the same type in each, so he brings a total of 4 pills to each victim, but that just sounds redundant to me, and unlikely. I noticed the same thing too... I think he plays a different game with Sherlock or they just made a mistake while filming the beggining scenes. If I remember correctly, the pills started off with 5 pills for first victim, then 4, then 3, then 2, then 1 for Sherlock. It always annoys me that bit. I can only assume that he must have altered the "game" slightly for Sherlock. Personally, I don't really believe that one pill had poison and the other didn't. As Sherlock pointed out, it's a 50/50 chance, and no matter how much bluffing, double bluffing and triple bluffing the cabbie does, it's still comes down to chance and no one can get lucky that many times. I've often wondered if he didn't just have both sets of pills poisoned but he just held the pills in his mouth and didn't actually swallow them. Well, the cabbie was not a very nice man, as John has pointed out to us, so I perfectly believe, that he might have cheated. 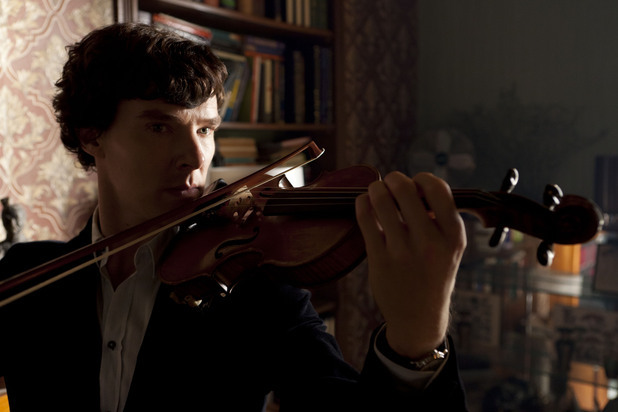 Sherlock was right, you can manipulate as much as you want, it's still chance. And if I had been the victim of the cabbie - even, if I would believe in his manipulative super powers - there are ways to bring it back to a 50% chance: I would just have not played the manipulation game of guessing and second guessing with him. I would have said something like 'one, two - out are you' in my head to create a 50/50 chance for myself. The cabbie could not have prevented it. So he was either 4 times lucky, which is not really that outrageously unbelievable (the sample here is not really big enough for viable statistics), or he cheated. If he cheated, John's intervention was literally vital for Sherlock, and I guess that was the main point of that scenario. The cabbie goaded Sherlock into almost doing something unbelievably stupid, and John rightfully calls Sherlock an idiot for engaging in such risky behaviour. Yeah, he really looks like he's about to take it as well. Silly Sherlock! This is very silly, but it stuck out for me so here goes.. In SIP, the scene when John is about to knock at 221B and SH joins him on getting out of a taxi and they are standing there talking on the pavement. Now, I should point out that SH later on tells John that he 's already moved in, which means he is already living there i.e. Mrs.Hudson is already his housekeeper. We never see them hugging or greeting each other on any other occasions when SH is entering or leaving his rooms. So when Mrs.Hudson opens the door and fondly hugs him, saying "Sherlock....", we assume that they are meeting after a long time! When in fact he's already her tennant! That seemed very odd to me, so yeah maybe you think it's stupid..yeah maybe it is!